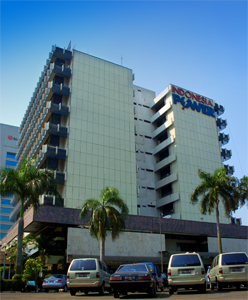 The government of Indonesia has been improving several alternative energy sources, including renewable energy, to meet increasing national energy demands. Renewable energy potential which includes biomass, geothermal, solar, hydro, wind, and oceanic current energy has largely been untouched, compared with the large potentials of Indonesian renewable energy. As a tropical nation, Indonesia has a very large solar energy potential. Based on solar radiation data collected from 18 locations across Indonesia, Indonesia’s solar radiation is classified into 2 different areas: Western part of Indonesia with a potential of 4,5 kWh/m2 per day and a monthly deviation of 10%, and the Eastern part of Indonesia with a potential of 5,1 kWh/m2 per day and a monthly deviation of 9%. Solar energy potential in Indonesia is very large, equivalent to 112,000 GWp, but which has been utilized only about 10 MWp. Currently, the government has issued a roadmap that targets the utilization of solar energy installed solar capacity by 2025 is equal to 0.87 GW or around 50 MWp / year. This amount is a picture of considerable market potential in the development of solar energy in the future. Two technologies have been implemented to harness this large solar potential, namely thermal energy and photovoltaic energy. Thermal energy is mainly used for cooking (solar stove), heating agricultural products, and water heating. Photovoltaic energy is used to meet electricity demands for several purposes, including water pumps, televisions, telecommunication equipments, and freezers in health centers with a total capacity of ± 6 MW. Solar energy utilization as a solar home system (SHS) is currently in a semi commercial stage. The main components of SESF are photovoltaic cells (converting solar energy into electricity), Balance of System, storage units (batteries), and other supporting equipments including inverter for pumps, and both a centralized and hybrid system. The main components of solar power generation systems (PLTS) using photovoltaic technology is the solar cell. Currently there are a lot of solar cell manufacturing technology. Conventional solar cells are already commercially today using crystalline silicon wafer technology production process is quite complex and expensive. In general, the conventional solar cell manufacturing process begins with the purification of silica to produce solar grade silica (ingot), followed by the cutting of silica into silica wafers. Further silica wafers are processed into solar cells, and solar cells arranged to form a solar module. The last step is to integrate the solar modules with the BOS (Balance of System) into solar systems. BOS is supporting components used in solar systems such as inverters, batteries, control systems, and others. Currently PLTS development in Indonesia has had a strong enough base of policy aspects. However, the implementation phase, the potential is there has not been utilized optimally. In technology, industrial photovoltaic (PV) in Indonesia is only able to perform on stage downstream, which manufactures solar modules and integrate them into solar power plant, the solar cell while still imported. Though solar cells are the main components and most expensive in the solar system. Prices are still high to be an important issue in the development of the solar cell industry. Various solar cell manufacturing technologies continue to be researched and developed in the framework of efforts to reduce the production cost of solar cells in order to compete with other energy sources. Given Indonesia’s electrification ratio only reached 55-70% and almost the entire area which is not electrified are rural areas far from the center of power, then PLTS which can be built in almost any location is very appropriate alternatives to be developed. In the period of 2005-2025, the government has planned to supply 1 million Solar Home System with a capacity of 50 Wp for low-income and 346.5 MWp solar hybrid to remote areas. Until 2025 the government plan there would be around 0.87 GW of installed solar capacity. Assuming a market control of up to 50%, the solar energy market in Indonesia is large enough to absorb the output of a solar cell factory with a capacity of up to 25 MWp per year. It is certainly a great opportunity for the local industry to develop its business to solar cell manufacturing.